William Fitzsimmons was one of the first artists that I noticed as being of the "best talent available to play here" catergory that I've been telling people was the criteria for the ArtFRONT Presentations artist selection from the beginning of the series. This goes all the way back to Myspace days and he has always been on my radar. Since then (2005) he has released seven albums but up until now the availability to have him onstage has eluded us here in Chattanooga, that's why I immediately accepted an offer from Windish Agency (who also sent us Kaki King) when Chattanooga was offered a spot on William's tour which quite impressively comprises one of the most extensive national & international concert tours happening. At that moment I wasn't aware of an incredible bonus attached to this deal, the inclusion of Ben Solee on this bill. Back to William Fitzsimmons. Another of the more high profile artists in his style category "Iron & Wine" has received a lot of airplay and press locally and it seemed to me that William Fitzsimmons was always simmering in the background somewhere just waiting to wash into the conciousness of the lovers of truly melodic folk artists and there seem to be a lot of those fans around. This time around He will bring his band to fill up Barking Legs Theater with the kind of Blissful sound quality the venue is so well suited for. Here's a page full of info and a studio recordings to give an idea what a treat we are in for on Saturday April 26th. ~R. It's no secret..... Ryan Oyer is working fervently putting the finishing touches on his latest album, and Hayley Graham, who is also 1/2 of "The Goodbye Girls" has become the most in-demand backup singer on Chattanooga's flourishing music scene. For a special opening treat Ryan will present us with some of his newest original material from his upcoming album with Hayley providing her perfect background harmonies to start us off with one of the most intense nights of rivetingly melodic music to come to town EVER. Here's a set of live songs from one of Ryan's full band shows at Rhythm & Brews. 8:00pm $15. advance $18. day of show. 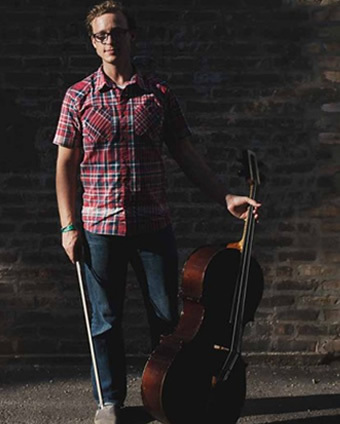 Known for his thrilling cello-playing that incorporates new techniques to create a unique mix of folk, bluegrass, jazz and R&B, Sollee possesses rough-smooth-smoky vocal stylings bordering on hip-hop and a knack for intricate arrangements that has brought about comparisons to Sufjan Stevens. Sollee shares himself completely with his audience, whether it be by personal lyrics, or his commitment to the environment. Sollee can often be found riding a bicycle to his concerts (cello strapped to the back), which have become legendary for their intimacy. His latest album, produced by Sollee himself, boasts a sublime cast of musicians, including Carl Broemel (My Morning Jacket) on electric/acoustic guitar and pedal steel, Alana Rocklin on bass, Jordon Ellis on percussion, Jeremy Kittel (formerly of the Turtle Island String Quartet) on violin, and guest vocals by Abigail Washburn. Sollee contributes octave mandolin, guitar, and of course, his signature cello. 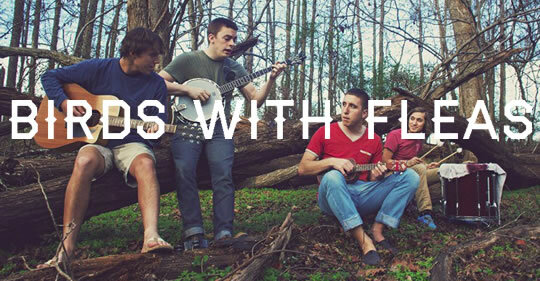 You can purchase tickets for William Fitzsimmons & Ben Sollee on Saturday Apr. 26th in advance or at the door. You can listen to WUTC FM 88.1's live streaming broadcast here The station has copies of these artists recordings so call in a request at (423)265-9882 and let them know You're interested in hearing more of these performers music. Past concerts brought to Chattanooga Audiences by ArtFRONT Presentations have included the following artists. You may see some of our local performers coming back to open up for nationally touring musicians when they come through. Ryan Oyer is one of those names I’d heard a thousand times without having the opportunity to hear him play. He must be one of the hardest-working men in show business—in Chattanooga anyway. I spent a long road trip listening to his discography and it occurred to me what a pity to have missed all those performances and what a treat to discover something so worthwhile right here. There is nothing particularly difficult about writing a song or unique about being a songwriter. Writing a good song is an altogether different matter, and good songwriters (like Ryan Oyer) are few and far between." ~Marc T. Michael: Chattanooga Pulse -"Singer/Songwriter Street Cred"
"I've been watching Ryan Oyer's development as a songwriter and front man for as long as he's been on Chattanooga's music landscape. One good way to guage a musician's effectiveness is by watching the reaction of the audience. Recently I'm noticing multiple audience members singing along with not just his older most familiar songs but with nearly all of them. Not bad for someone who hasn't hit the top 40 airwaves yet! Ryan's confidence, perseverance and relentless performing are the missing ingredients of many other talented singer-songwriters who fall by the wayside. 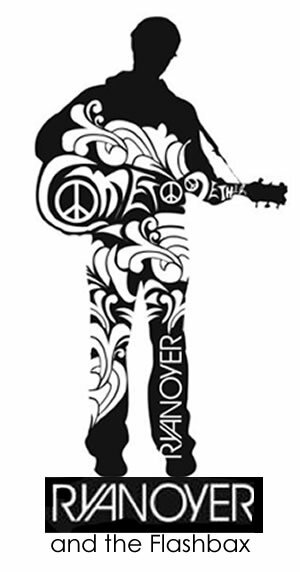 Expect to keep hearing Ryan Oyer's name and songs for a long time to come." & "By Order of the Queen"
Amber Fults' voice and songs send chills and brings tears and smiles to everyone who experiences them. Amber enwraps audiences in all of the emotions that inspire the songs themselves and you leave her shows unabashedly wanting more. "By Order Of The Queen." Teenage duo Beth Ireland (vocals/guitar) and Rebekah Davis (vocals/bass) have won the hearts of their contemporary Chattanooga musicians with their pop arrangements, youthful lyrics, and whimsical stage presence. Leaning heavily on classic rock influences, they cut their teeth on the sensibilities of the British Invasion and Britpop movements. They are now launching into original songriting territory. Angel Snow One of our most loved local success stories returns for a very special double billed concert with The Little Country Giants to bring her level of blissful entertainment to our most in-the-know aesthetic purist audience. These days Angel seems to be able to play just about anywhere she wants to go as her tour schedule shows those of us who have been keeping up with her nationwide performances. Angel continues to be backed up by some of the finest musicians Nashville has to offer and everyone is on the edge of their seats waiting to see what venue or city Angel will conquer next. A Native of Chickamauga Georgia, Angel grew up close enough to Chatttanooga's back yard to be claimed as a home town prodigy without any regard for cross border identity crisis in the Tennessee/Georgia bio-region. Once You've played the Ryman Auditorium in Nashville, written songs for Alison Krauss and Union Station and been welcomed on tour in New York City and dozens of increasingly high end performance stages across the nation it counts for a lot of heads turning in her direction. Welcome home Angel. The Little Country Giants The soul melting vocal harmonies of the Americana duo Russel and Cameron Federal Cook with backup from an astounding array of regional musicians including virtuoso fiddler Rurik Nunan, have been one of the shining hallmark performers of the ArtFRONT concert series. The Little Country Giants still boast the largest attended show ArtFRONT has produced at Barking Legs, outdoing even Kaki King in attendance. It's no wonder that when the Giants first started coming around our audience which includes a large percentage who heard them played repeatedly on WUTC 88.1 fm felt as if a treasure chest of exactly the kind of musical gems they had been looking for just fell into our laps. Lately The Little Country Giants have been increasingly in demand across the nation and have just returned from a series of engagements in California and the Northeast. We've seen a continuous cycle of productivity from this group, whether they're recording new albums, going on tour or settling in to live a genuine southern family life and entertain their neighbors in the Georgia hills, we know that they will always deliver a powerful and moving experience for us all. This year The Little Country Giants will give us another great reason to be thankful for the unique opportunity to experience some of the most genuine and melodically gorgeous country music on earth. An interview and live radio performance is scheduled on Tommy Cotter’s WUTC 88.1 evening music show on Wed. Nov. 13th 9pm. Birds With Fleas is what happens when banjo and ukelele meet the backbeat of rock and roll and the vocal barrages of a gospel choir. Matt Siegel (vocals/banjo/uke) and Spencer Karges (vocals/guitar/percussion) form the frontline while Drew Daniels (drums) and James Glass (bass) provide the grooves for your body. Bombadil is on another roll across the USA with a multi city tour. These Ramseur Records (home base of The Avett Brothers) artists have been touring relentlessly since forming in 2004 and on this tour they have been playing festivals and opening for some of the highest profile Americana & folk acts such ad David Wax Museum, Doctor Dog and others. They've been profiled on N.P.R. nationwide and have become a headlining attraction for crowds from their native Raleigh/Durham Chapel hill area’s vibrant music scene. 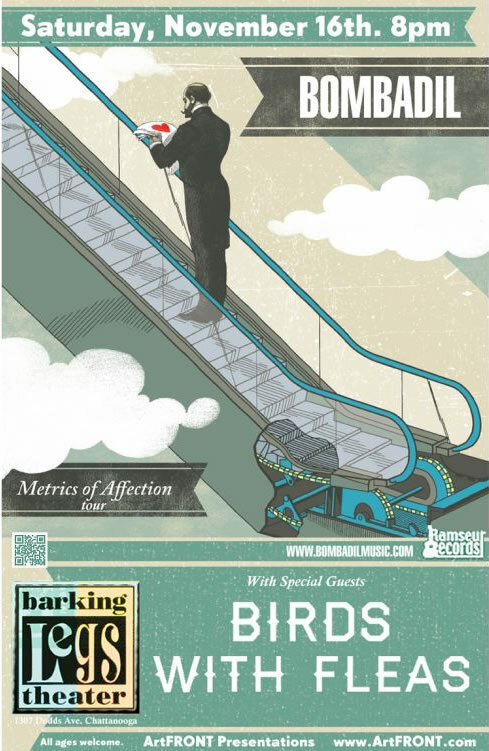 This will be their second appearance at Barking Legs Theater & sees them returning as a longtime mainstay of Ramseur records management with a new CD released this summer titled “Metrics of Affection” their 4th full length studio release. The familiar voices of Bombadil are back. The band who is named after an obscure character in the Tolkien universe “tells tales of loneliness, heartache, awkwardness, puppy love, suicide and murder-by-drowning.” But now perhaps even more darkly and introspective than in past incarnations. 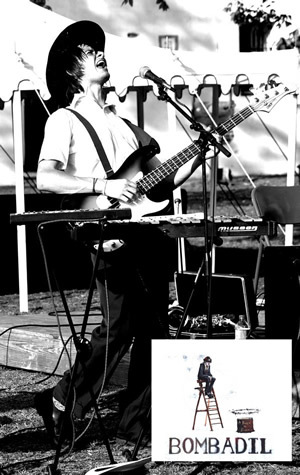 Bombadil is: Daniel Michalak • bass, piano, harmonica James Phillips • drums Stuart Robinson • piano, ukulele. Introducing Tiffany Taylor. A regular performer on Chattanooga's open mic. scene for the last few years, Tiffany has surfaced from that mix with some of this community's most memorable original songs ("Dirty Minded Boys" is the kind of hit material major label performers clamor for...) Her voice and stage presence is developing into the kind of genuine southern charm that Tift Merritt displays while her confidence can be observed growing each week. 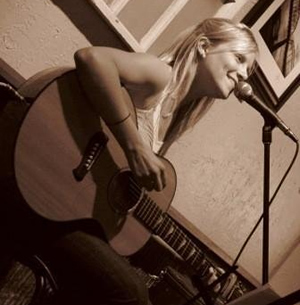 Tiffany Taylor was chosen to receive Chattanooga's 2012 MakeWork grant for songwriting, which sponsors her to produce an entire original album utilizing local studios and musicians. She will document the process to provide other aspiring songwriters with an online guide through the entire songwriting process. Her guide is intended to help other artists overcome the emotional ups and downs of writing, performing, and producing an album. ArtFRONT Presentations is proud to be one of the first independent sponsors of a full spotlight on Tiffany Taylor's performance in the immaculately produced sound quality of Barking Legs' listening room. Little Country Giants are one of the most profoundly genuine Americana groups in the country. This can be said about a lot of traditional style musicians but the brilliant melodic songwriting and vocals of Cameron Federal Cook and husband Russel Cook push them into the realm of genius on many levels. One of the earlier discoveries and offerings of the ArtFRONT concert series, The Little Country Giants still boast the largest attended show we have produced at Barking Legs, outdoing even Kaki King in attendance. This return performance comes after a long developmental break, while the family took the opportunity to raise babies, teach school and continue to distill their familial harmonies and song crafting expertise. We are very fortunate to have them living so close by that they have made Barking Legs a regular stop while on tour across the country. Natives of Rome and now Ranger Georgia, there is no influence they have had to reach outside the southern hills for, no reason whatsoever to struggle to find an outside inspiration. Their talent is so natural that it brings chills to the listener as they are absorbed completely into the true purpose of music whenever the Little Country Giants are on a roll, either onstage or in the totality of the craftsmanship of their recordings. The Band's new CD "60 Grit"
indicates a coarse grade of sandpaper, for Heavy sanding and stripping, roughing up the surface. Keep in mind that "stripped down" by Little Country Giants' standards is Cameron Cook on upright bass and vocals and Russel Cook on guitar and vocals, essentially a 4 piece in any other band right there. Then add in Rurik Nunan on fiddle, (5 piece!) and a brush & snare player and it's a complete ensemble with traditional style vocal harmonies. Bundling this much raw talent and ability togther makes for a tight little bundle indeed. Rough? it never enters the picture. The Giants swing, sometimes slowly sometimes quick tempo. If I had named this album it would've been "150 Grit" - Fine. Woodford Sessions There's been a lot of talk about Chattanooga's local music lately. From listening to their riveting set of studio recordings the duo of Woodford sessions, Dan (Danimal) Pinson and Michael Gallaway is shaping up as Chattanooga's premier songwriting team. This duo has double teamed on melodic inventiveness, churning out a sheaf of songs that won't get out of your head. If You're a fan of neo-folk americana rockers ranging from Band of Horses to Avett Brothers all the way back to Neil Young & Simon & Garfunkle You need to hear this project because there's not a lot of new stuff that comes close to this level of songwriting and delivery. After seeing a lot of phenomenal talent spring out of East Tennessee over the last few years it's still not presumptious to say HERE is a group that has the power to go places. It's like the Avett's calmed down and really learned to sing and write gorgeous tunes. Dan & Michael's experience as instrumentalists in rock bands (Ickybod Crankin, Glowing Bordis, Up With The Joneses, Nim Nims) has given them tremendous range in instrumentation as evidenced in the music You can hear on their website. Anyone wanting to experience the next level of creativity in melodic songwriting and performance should park themselves here for the evening. Expect to hear a lot of memorable songs from Woodford Sessions and Angel Snow. *Special discount for early online purchase of your admission to see Angel Snow, attend ELIZA RICKMAN & AMANDA ROSE CAGLE on Thursday Nov.15th at 2 for 1 admission price! Angel Snow Keeps making the most impressive leaps forward in her musical career. Fresh from her successful collaboration with Alison Krauss, Angel has embarked upon her own national tour to celebrate the release of her debut full length album "Angel Snow" with a special hometown performance at Barking Legs which is sure to draw many of her closest friends and supporters in a "family reunion" style homecoming show. Angel's concerts are always a warm celebration of music supporters and this will be a genuine holiday treat for all who attend. ~R. Sometimes sorrowful, often hopeful, and always looking toward faith, Snow’s music shows that the highest caliber of artistry is often intertwined with the deepest sincerity. Her heartfelt lyrics combine with sweeping folk and blues melodies to create a captivating landscape of delicate, beautiful sound. This time around Angel brings her veteran backup player Jason Goforth with his wonderful, creative and ethereal lap steel guitar and she will also incorporate the multi-talented services of Chattanooga musician Dan Pinson of the Woodford Sessions on bass guitar. Amanda Rose Cagle is also known as Amanda Rose by her musical & touring partner Christabel of Christabel and the Jons and other times as as "Mander." Amanda is a very active Chattanooga based professional multi-instrumental performer who has played with many groups, including the Sweet Georgia Sound big band, Christabel & the Jons, The Shaking Ray Levis, Big Kitty & Trigger Mortis. She's Fronted a gritty rockabilly trio, Saturnine Tales as well as performed in musical theater projects and church. Amanda is a classically trained pianist with a passion for double bass and woodwinds who is inspired by diverse late 20th century artists such as Nellie McKay, Tori Amos and Diamanda Galas. Barking Legs rolls out the grand piano for Eliza Rickman and local multi instrumental artist Amanda Cagle. "Subtle & minimal, it felt like a just post-fall of civilization show at a derelict piano bar. It was utterly delightful." "trying to describe Eliza’s live-set is like trying to make a drawing of the flavour of root-beer. Both Artists featured in this show promise to deliver a creative performance unlike most anything You've yet to hear. ~R. When Cameron Cook of Little Country Giants said they would be bringing two hand picked support acts with them I was unfamiliar with the names WB. Givens & The Kid Carsons. Since then Cameron has called back twice and spent a LOT of time elaborating how much admiration The Giants have for these new artists whom they are touring with. Citing brother and sister harmonies and total dedication to their music, Cameron whose taste in music I have learned to trust, proclaims that these artists WILL be remembered in Chattanooga after this show, even comparing them to favorites such as the everybodyfields, promising that this will be an entire evening of equally stirring performance and that WB Givens & The Kid Carsons are much more than opening acts but are on the road to recognition everywhere an audience has a chance to hear them. You can find their info, audio and video on these links. *Special discount for attending both Friday & Saturday shows for purchasing in advance! Little Country Giants are one of the most profoundly genuine Americana groups in the country. This can be said about a lot of traditional style musicians but the brilliant melodic songwriting and vocals of Cameron Federal Cook and husband Russel Cook push them into the realm of genius on many levels. One of the earlier discoveries and offerings of the ArtFRONT concert series, The Little Country Giants still boast the largest attended show we have produced at Barking Legs, outdoing even Kaki King in attendance. This return performance comes after a long wait while the family took the opportunity to raise babies, teach school and continue to distill their familial harmonies and song crafting expertise. We are very fortunate to have them so close by that they have made Barking Legs a regular stop while on tour across the country. Natives of Rome and now Ranger Georgia, there is no influence they have had to reach outside the southern hills for, no reason whatsoever to struggle to find an outside inspiration. Their talent is so natural that it brings chills to the listener as they are absorbed completely into the true purpose of music whenever the Little Country Giants are on a roll either onstage or in the totality of the craftsmanship of their recordings. indicates a coarse grade of sandpaper, for Heavy sanding and stripping, roughing up the surface. Keep in mind that "stripped down" by Little Country Giants' standards is Cameron Cook on upright bass and vocals and Russel Cook on guitar and vocals, essentially a 4 piece in any other band right there. Then add in a fiddle, (5 piece!) and a brush & snare player and it's a complete ensemble with traditional style vocal harmonies. Bundling this much raw talent and ability togther makes for a tight little bundle indeed. Rough? it never enters the picture. The Giants swing, sometimes slowly sometimes quick tempo. If I had named this album it would've been "150 Grit" - Fine. 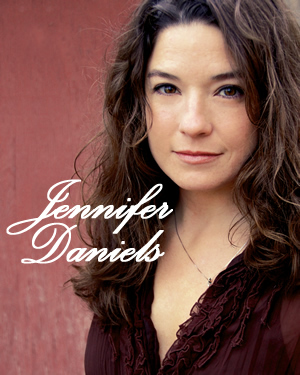 When Chattanooga's musical phenomenon Jennifer Daniels anchors this concert with her complexly crafted melodies. The depth and beauty of her songwriting and vocals has inspired crowds at home and in the most refined listening rooms and folk festivals on a regular basis for a decade. Always a crowd bringer, Jennifer stepped briefly out of the spotlight to raise her twins and develop a teaching career paralell to her musical success. With her husband Jeff Neal, Jennifer is now embarking on more concert tours and this hometown appearance is sure to draw loyal fans out to see her emerge from the cocoon to dazzle us once again with her full instrumental setup. 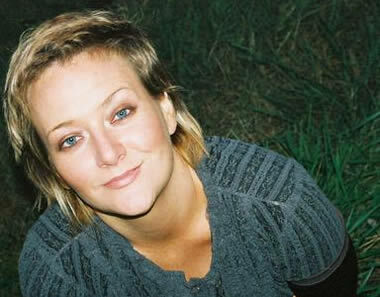 Jennifer's most recent recording project "Come Undone" compliments her three previous award winning album releases, Fists of Flood," "Dive and Fly" and "Summer Filled Sky." 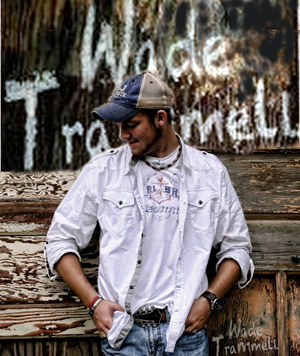 Wade Trammell was spotted by Chattanooga Country radio mainstay US 101 and featured prominently on their "Backwoods" local music talent search. When von Grey manager/agent Rich Piombino was searching for local support for this show he reached out to his friends and colleagues at US 101 and Wade Trammell with his full band was their top recommendation for upcoming local talent and live performance to balance out the youthful and sometimes rustically inspired instrumental and vocal presentation of the sisters from Atlanta. Wade has been touring in the southeast playing local festivals and concert halls, gaining a following through the popularity of his musical style and the passionate conviction of his lyrics and performamce. His popular song "American Hero" taps into the collective mindset of a large percentage of solid true-blooded American music lovers. Wade's full six piece band will perform a set of his contemporary country-rock songs at the end of the evening for a rousing finale to all the energy and intense spirits sure to be generated by all these uber-talented ladies. With their soulful four-part harmonies, poetic lyrics and indelible melodies, it’s easy to see why critics have hailed von Grey as “nothing short of stunning.” They sound like they were born to play together – and, in fact, they were. The four sisters have been playing music nearly their entire lives. Classically trained from an early age, the Atlanta-based quartet – Kathryn, Annika, Fiona and Petra von Grey – have built on that foundation by performing upwards of 200 shows in the past two years, from recurring residency tours at intimate venues throughout the southeastern U.S. to supporting gigs with such artists as Sarah McLachlan & The Chieftains. The band has chosen Chattanooga as the final date in their 16-venue, 5 week cross-country tour. The band will have recently played such nationally-recognized clubs as World Café Life (Philadelphia), The Bitter End (NYC,) Jammin’ Java (DC) and South Moe’s (Denver.) 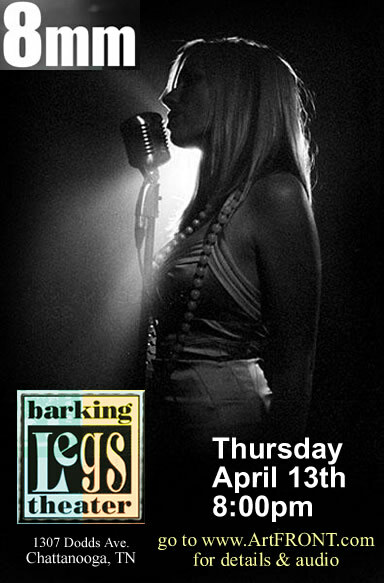 This Barking Legs show provides an opportunity to see this rapidly-rising band in an intimate theater setting. Their forthcoming five-song EP, recorded with GRAMMY® award-winning producer/engineer Nick DiDia (Bruce Springsteen, Train, The Gaslight Anthem,) captures the band’s essence and the raw intensity of their live performances. 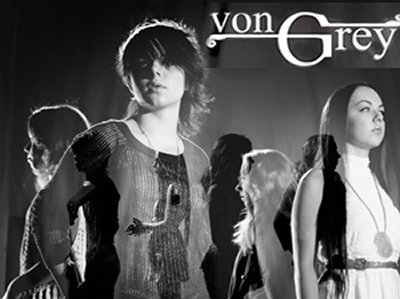 Working in a vein similar to that of such contemporaries as The Civil Wars and Mumford & Sons, but with powerful, melodic harmonies, von Grey masterfully melds folk, pop, Celtic and rock influences, imbuing time-honored musical idioms with a distinctly modern sensibility. An Athens, GA Flagpole Magazine band of the year, featuring vocal harmonies and multiple instrumentals by sisters Claire & Paige Campbell with Suny Lyon. No other group acheives the mysterious intrigue of these highly sought after performers and darlings of the independent music press. They are in the final stage of releasing their fourth studio album called "Life Inside The Body" on Mazarine Records, following "Hours in the Attic," which contains eighteen songs all recorded live at their concerts, which will be available at the show. Audiences are typically astounded by the sophisticated harmonic approach to their original southern ballads and lyrical storyteling on an artists' canvas of surprising acoustic instrumentation including Claire's famous singing saw which, in her skilled hands, rivals the sounds of any electronic instrument. The last time Hope for A Goldensummer came to Barking Legs was the weekend of the devastating tornadoes in April, 2011. Even w ith all the chaos and power outages a good group of their fans still came out but if You missed them here's another chance to see Hope for A Goldensummer in their ideal setting. 4 Hope for a Goldensummer live recordings are streaming on the ArtFRONT music Showcase page. 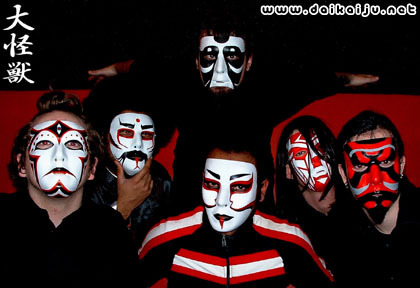 And experience an onstage collaboration with the band Ickybod Crankin through this video. Barking Legs Theater will be rolling out their Grand piano for three of the most unique instrumental and vocal acts this season. Hudson K Knoxville music scene mainstay Christina Horn performs a full set of her cabaret rock ballads backed by the full band who together are Hudson K. Led by one of the most versatile keyboardists and vocalists in the region, Hudson K puts on a rousing, elaborate arrangement of anti-pop and piano rock pieces. In addition to constantly generating live music for Knoxville Hudson K has been building a following in Chattanooga with live performances at nearly every venue in town. With a wide range of styles in their repertoire, Hudson K works toward pleasing their audience by delivering something for almost everybody while always surprising with shifting tempos and storyline based songwriting. Christina's distinctively smoky vocals will be immediately recognizable once You've experienced their show. 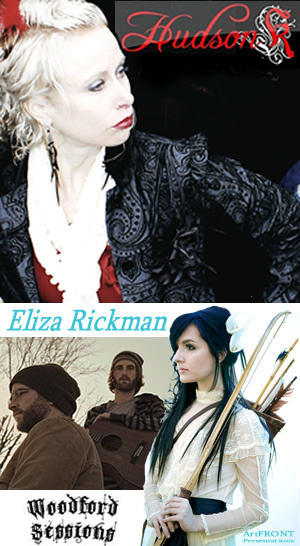 Eliza Rickman is on a roll across the USA with a multi city tour, playing nearly every night since the release this March of her new full length album"O You Sinners" produced by Andrew Bird's and Wilco's studio whiz Mark Greenberg. This recording showcases one seriously impressive new vocalist. Eliza Rickman's highly polished delivery sounds as if Emmylou Harris were singing arrangements by Tori Amos or Fiona Apple, soaring and ethereal and solid. Intricately arranged by a musician who's studied orchestral composition, a lot of minor key arrangements puts Eliza's Music squarely outside of any Americana genre despite the Emmylou Harris vocal comparison. 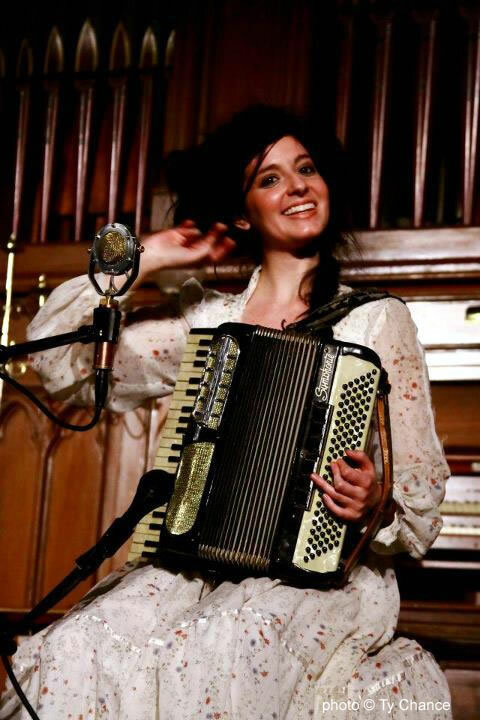 Sounding more like the soundtrack to a Neil Gaiman story, Eliza incorporates toy piano over her studio arrangements and plays onstage with that instrument as well as accordion and piano. "Darkly beautiful" sums up the mood of the whole album. Gushing reports from audiences who are seeing Eliza on this tour are building excitement levels as April 7th approaches. Fans of art-house music video production can get a look at Eliza Rickman's imaginative dark side while listening to the chilling vocals that make her a serious new entry on the American music scene. Woodford Sessions There's been a lot of talk about Chattanooga's "local" music lately. From listening to their riveting set of studio recordings the core duo of Woodford sessions, Dan (Danimal) Pinson and Michael Gallaway is shaping up as Chattanooga's premier songwriting team. This duo has double teamed on melodic inventiveness, churning out a sheaf of songs that won't get out of your head. If You're a fan of neo-folk americana rockers ranging from Band of Horses to Avett Brothers all the way back to Neil Young & Simon & Garfunkle You need to hear this project because there's not a lot of new stuff that comes close to this level of songwriting and delivery. After seeing a lot of phenomenal talent spring out of East Tennessee over the last few years it's still not presumptious to say HERE is a group that has the power to go places. It's like the Avett's calmed down and really learned to sing and write gorgeous tunes. Dan & Michael's experience as instrumentalists in rock bands (Ickybod Crankin, Glowing Bordis, Up With The Joneses, Nim Nims) has given them tremendous range in instrumentation as evidenced in the music You can hear on their website. Anyone wanting to experience the next level of creativity in melodic songwriting and performance should park themselves here for the evening. Expect to hear a lot of memorable songs from Woodford Sessions. Kaki King will return to her acoustic roots this fall for a national tour that will make stops at renowned venues such as the Moma in New York City, Yoshi's in San Francisco World Cafe Live in Philadelphia and of course Barking Legs in Chattanooga! King's career has been enthralling, as it has evolved from its virtuosic acoustic busker beginnings in the subways of New York to creating cerebral soundscapes with Tortoise's John McIntyre to being included on Rolling Stone magazine's short list of "Guitar Gods" to collaborations with Foo Fighters and The Mountain Goats. In her 10-year career, King has released five full length albums and two EPs. She has scored for television and film, most notably alongside Eddie Vedder and Michael Brook as composers for Sean Penn's "Into the Wild" for which she received a Best Original Score Golden Globe nomination. King also contributed to the Grammy-nominated August Rush soundtrack, and in 2009, Ovation launched their Kaki King signature guitar model, which is now for sale worldwide. King's latest record, 2010's "Junior" (Rounder Records), was perhaps her most concise artistic statement with a band to date, bringing her unique guitar style into power rock-trio form. Spin awarded the album eight out of 10 stars, and USA Today called the songs "bracing and fascinating." For this next phase, King has decided to take all of these musical experiences back to where it all began -- one woman and a guitar, or in this case, a group of guitars. 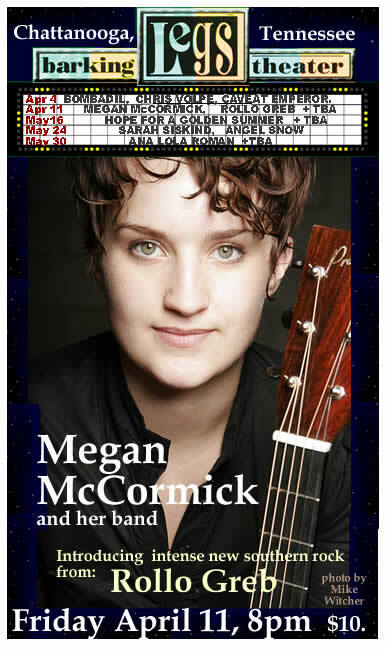 When her Agency pitched this show to ArtFRONT Presentations she stated "She has been doing these great intimate shows with up to 10 guitars surrounding her." And once the contract was in front of me I realized Kaki intends to play a LONG set with a break in the middle. There's a lot of variety in Kaki's guitar & vocal work. If you're just now getting acquainted there are lots of videos of Kaki playing every style from light melodic to grunge rock to impeccable jazz.. If You're a fan of Kaki King You won't find a more intimate & up close performance to see this established star play in. Tickets are limited so You better get yours now . ~R. Chattanooga’s Alex Thompson has been mesmerizing live audiences and gaining new fans daily with his recent album Western Medicine. This will be Alex’s homecoming show and local CD release after his first nationwide tour opening shows for Zoe Boekbinder, who has just released her dazzling second album which You can stream or download in it's entirety here; Darling Specimens. The ALEXANDERS” would be a great angle and at the end of their tour together it makes a lot of sense. Alex Thompson and Zoe Boekbinder are presenting an act that a lot of folks in Chattanooga are excited about, having already been impressed with their ongoing solo performances. Zoe, also a big fan of Kaki King is driving 12 hours off her tour route to play this special event. This night will also be a great prelude to Zoe’s return to Barking Legs to play her own full set on Nov. 26th, along with BIG KITTY & "Strung Like A Horse." So don’t miss Alex Thompson & Zoe Boekbinder joining together as The ALEXANDERS for this very special night. More in-depth reviews of Alex Thompson and Zoe Boekbinder's music can be read by scrolling down this page to our future & past shows. The ArtFRONT concert series re-ignites with three stage proven performers. Hope For A Golden Summer an Athens, GA Flagpole Magazine band of the year featuring vocal harmonies and multiple instrumentals by sisters Claire & Paige Campbell and latest addition to the band, Suny Lyon. No other group acheives the mysterious intrigue of these highly sought after performers and darlings of the music press. They have released a new full length album "Hours in the Attic," containing eighteen songs all recorded live at their concerts, which will be available at the show. 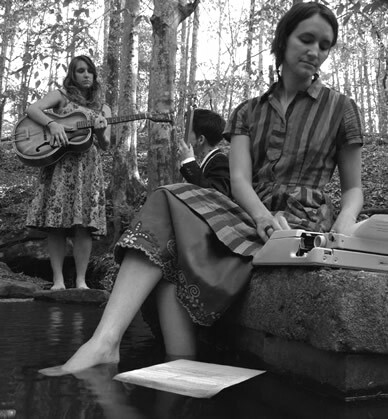 Audiences are typically astounded by the sophisticated harmonic approach to their original southern ballads and lyrical storyteling on an artists canvas of surprising acoustic instrumentation including Claire's famous singing saw which, in her skilled hands, rivals the sounds of any electronic instrument. 4 Live songs on the ArtFRONT podcast! Hope for a Goldensummer live! Zoe Boekbinder an Oakland, CA based performer who posesses a masterful command of the live looping station applied to her acoustic instruments and vocals in a manner to rival Andrew Bird. Zoe's overall performance is an animated cabaret style experience with vocals approaching operatic range. Her complex lyrical approach and sense of humor keeps audiences leaning forward to catch every word. No stranger to the stage, Zoe has toured for the past five years sharing stages with acts such as Amanda Palmer, the Dresden Dolls & The Ditty Bops. Her earlier band project "Vermillion Lies" headlined venues such as San Francisco's Great American Music Hall and Circo de Braga in Portugal. Zoe's first full length Album released in Sept. 2009 "Artichoke Perfume" was a collaboration with producer Cesar Alvarez (Brooklyn, NY) of "The Lisps." This CD will be available at the show so be sure to see Zoe here at Barking Legs before she takes her tour back to the west coast to begin recording her second full length album. Alex Thompson and he will have any audience's attention completely riveted. The depth of his vocal prowess and unforgettable melodies and guitar compositions have made Alex one of the top local talents to watch, as anyone who attended his opening performance for our packed out show with Angel Snow/Viktor Krauss or his recent set at Eddie's Attic in Atlanta will confirm. 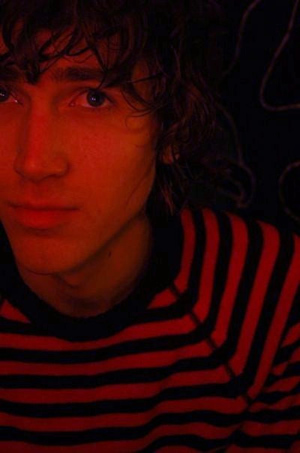 Though influenced by Jeff Buckley & Elliot Smith the uniqueness of Alex's songs remove him far from any comparison to standard singer songwriters. For this show Alex is working on a surprise collaboration with some of his favorite hand picked backing musicians. We will all just have to come to the show to see what new direction Alex is ready to take us in. Barking Legs Theater, 8:00pm $12. 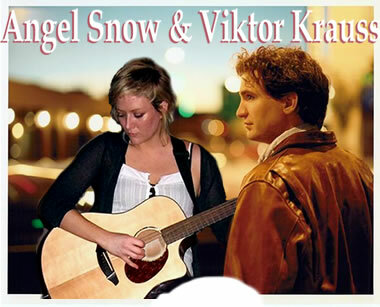 Angel Snow with Viktor Krauss Angel Snow has become a local favorite in Chattanooga. A crowd pleaser with the talented back up of Jason Goforth on lap steel and occasionally Bryn Davies of "Uncle Earl" on upright bass. Angel has delighted many audiences here and built up a solid reputation. Now Angel has teamed up with Viktor Krauss, Legendary sessions Musician and brother to Grammy winner Alison Krauss, for a substantially bigger sound and world class backup. The duo are recording a new CD which is due out in October. Viktor Krauss has played on many recordings and live shows with artists such as Elvis Costello, Gram Nash and Lyle Lovett. He is a multi instrumentalist and producer who is widely reknowned for his inventive bass playing and tight studio arrangements. If You've seen Angel Snow previously at Barking Legs this new teamup with Viktor Krauss will be a totaly new experience worthy of your repeat attendance. Take a look at his massive discography to see why we are so excited to have this heavy hitter coming to Barking Legs. Ryan Oyer has risen to the top of Chattanooga's crowded open mic scene over the last year due to his upbeat attitude, catchy tunes and general "front man" stage presence. Upon lots of encouragement he has assembled a band of the top local players that has included Butch Ross, Mike McDade & Kyle McKillop. This assembly provides Ryan with an inventive and ethereal sounding backing band that has elevated him well above the local singer songwriter genera and into an all around solid listening experience. 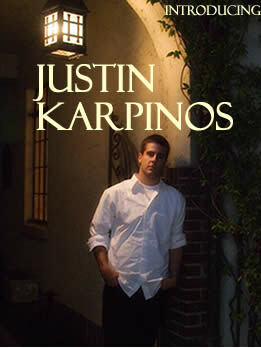 His new locally produced full length CD "Come Together" will be available at the show. Alex Thompson is a Chattanooga area singer and guitarist writing original songs in the melodic folk style. Highly influenced by Jeff Buckley & Elliot Smith some of his songs are even eerily reminiscent of early Tyrannosaurus Rex era Marc Bolan. Alex puts on a very pleasant and articulately delivered performance. Experimental, Inspired & original tunes, a real nice break from the tidal wave of standard sounding local singer songwriters. at "The Basement" in Nashville. A recent show at the legendary Joe's Pub in Manhattan, New York, after returning from their two-month European tour. Filmed by New York City's Suite Spot Production Company. These twin sisters from Iowa, Now based in New York City, have one of the most powerful, yet gentle stage presentations on tour. I've been keeping up with them for about three years looking for any opportunity to bring them to Barking Legs. Their second full length CD has just been completed under the production of Malcolm Burn, Grammy winning producer of Emmylou Harris' "Red Dirt Girl." The Bowman twins are Claire Bowman on vocals, vocal harmonies and various percussion and Sarah Bowman on guitar, vocals and vocal harmonies. Between the two they manage to sound like an orchestra from time to time. 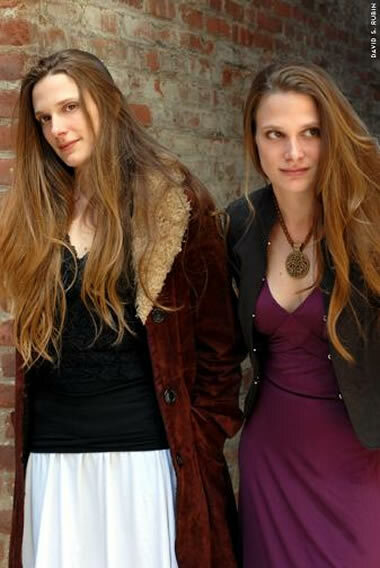 Sarah, a classically trained musician and the main songwriter of the duo successfully exploits the twin sisters' harmonies by combining their near telepathic soulfulness with universally understood, down to earth lyric storytelling and can suddenly turn their ship around in a very sophisticated manner by blending in almost madrigal sounding choruses of intimate vocal complexity. These two are on the way to performing one of the most memorable touring shows of the year with dozens of shows booked in the USA and Europe. Anyone with an eye for true and rare gems should check www.myspace.com/thebowmans and drive as far as You must to see The Bowmans live. 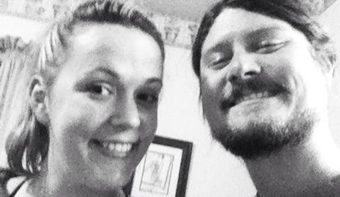 Angel Snow of Chickamauga, GA has had her most successful year in music so far. Recently winning the top prize in Eddie's Attic's Open Mic Shootout XXIX, a talent showcase in front of a sold-out room of music industry professionals and music fans. Previous winners of the Eddie's Attic shootout include John Mayer and Sugarland's Jennifer Nettles. Angel's recent performances have been stirring up regional press and entertainment writers acrosss the southeast. 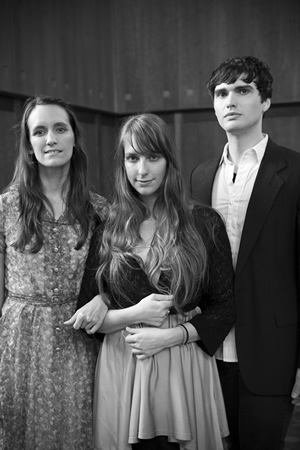 Angel put on two of the most memorable Barking Legs performances of 2008, opening for Charles Allison and for grammy winning songwriter Sarah Siskind, so it was an easy choice inviting her to co-bill with the phenomenal Bowman twins. Angel will perform along with sideman Jason Goforth who adds a very atmospheric and non-traditional steel guitar backup, making Angel Snow's performance that much more captivating. 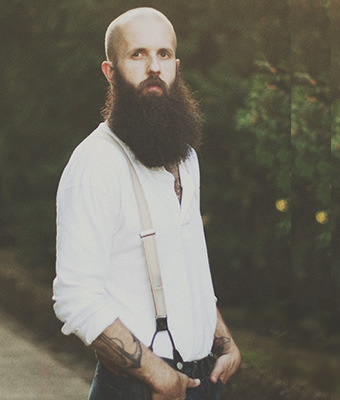 and beyond-traditional for a singer songwriter with southern roots. Sarah Siskind Writes intensely gorgeous Songs for Allison Krauss, and for her own band and vocal projects. In searching for the top notch talent that is available to come to Chattanooga to play there have not been many who have reached the professional level of Sarah Siskind. She's had two of her songs recorded by Alison Krauss. "Simple Love" from the A Hundred Miles Or More collection has been nominated "Best Female Country Vocal Performance" for the 2008 Grammy Awards and Bill Frisell played guitar on her early solo recordings. Sarah works behind the scenes as one of the most intense creative presences in Nashville’s music scene, recording and performing live with others in the Nashville underground talent pool that gives real substance to the bigger industry and props it up with genuine artistic integrity. Her duo performance at Barking Legs may give the impression of a younger, psychedelic Joni Mitchell who can break into genuine Appalachian Americana on a whim. Sarah's unique original vocal work is unforgettable once experienced. Call in to WUTC 88.1 to request songs by Sarah Siskind and help give our community a taste of this important young musician as her career is just beginning to skyrocket. Angel Snow A native of Chickamauga, GA who has traveled the country playng and singing her original songs has relocated to Nashville to make a serious go of her considerable talents. Angel put on one of the most memorable performances of the year a few weeks ago opening for Charles Allison at Barking Legs, so we've invited her back to open this show with Sarah Siskind, which should be one of the most compelling singer songwriter events of the year. Angel will perform along with sideman Jason Goforth who adds a very atmospheric and non-traditional steel guitar backup to Angel's soothing vocals and memorable melodies, making Angel Snow's performance much more captivating than just a regular singer songwriter onstage. 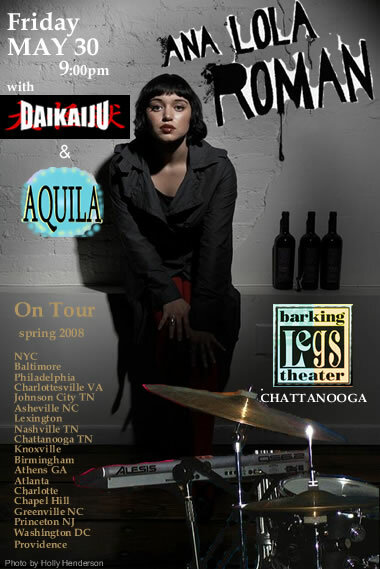 Ana Lola Roman Avant garde art rocker from NYC comes to radicalize the southeast with her Primal beats and Kate Bush meets Public Image Limited vocals, keyboard and percussion work. A psychedelic nursery rhyme or two could be tossed in for good balance. Former "Table" math-rock drummer Tim Stevens Joins Ana on this 2 week mini tour of the southeast, gracing Barking Legs with her show before heading off to set her sights on the northeast and onward to Europe.. Be sure to check out her videos and online music for a taste of the completely unique experience this show will bring. Barking Legs Theater 9:00pm $12. A very melodic female vocal fueled project with a thoroughly modern approach to Americana music. North American Royalty is one of Chattanooga's most broadly appealing and highly listenable musical offerings. They have recently put the finishing touches on their second studio album "Miraway," So there will be lots of new material for their fans at this show. Returning from their relocation to Memphis for their first Chattanooga show in Months, now is the time to see them since they will be concentrating on touring and their appearances in town will become more of a rarity. 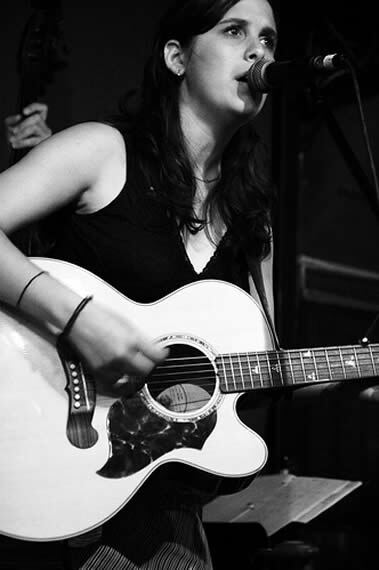 Songwriter Elise Berkes is on lead vocals & guitar. 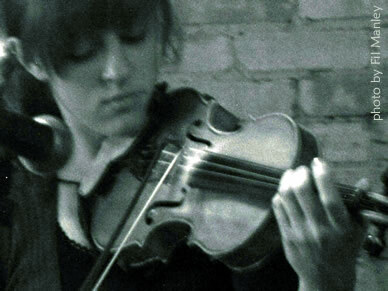 Krista Wroten on violin, keys and vocals, Jack Kirton, guitar, mandolin & steel guitar. Dennis Hubbard and Joey Berkley on bass & percussion. One of Athens Georgia's most talked about musical offerings, fresh from recording their second studio album. Any search online for this band reveals pages of gushing press that reads like a literary journal. The New Yorker, Oct. 2006 .... Almost impossibly warm, intricate harmonies over slow waltz tempos, backed by slide and lap-guitar and a drummer who occasionally rattles a case of old Coke bottles. Philadelphia City Paper 2005 ... Sisters Claire and Page Campbell sing about God and heartbreak like they're drunk on their own glorious harmonies as they swap xylophones, guitars and stories. Rough Trade Records 2005 ... an exceptional, haunting debut ...this is strange, soulful and deeply affecting stuff. think a rural, ornate cat power or a female arcade fire. Eyedrum Gallery, (Atlanta) May 2005 ... Front porch rocking chair bluegrass country concoction. The south never had it so good. Matt Morello, Stylus Magazine....Friends, Hope for A Golden Summer are responsible for three of the most beautiful shows I've ever seen and one of the best albums I've ever heard. Their music is folk and pop and country, but not any of those exactly; it's music from a real place, that ideal South they're making for themselves and everyone. 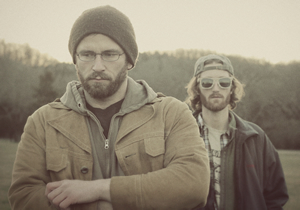 Kevin Thornton, Luke Jones and Enoch Porch created major waves in Nashville's music underground under their former band name THORNTON. Winning critical acclaim and Nashville Rage's experimental band of the year award. Now revitalized and heading out into the world again as Waves on Waves. This overwhelmingly together ensemble will make You forget about the current wave of female harmony singers with their all male harmonic vocals & pop/soul multi-instrumental powers. Compared with Jeff Buckley, Rufus Wainwright and even Joe Jackson, these guys put on one of the most intense of the early ArtFRONT concerts and we've been dying to get them back again and into the excellent sound setup at Barking Legs Theater. Named for a character in a Jack Kerouac novel, these uber-tight southern rockers have a very well produced bunch of recorded songs. Steeped in the new tradition of high end musical education at M.T.S.U. 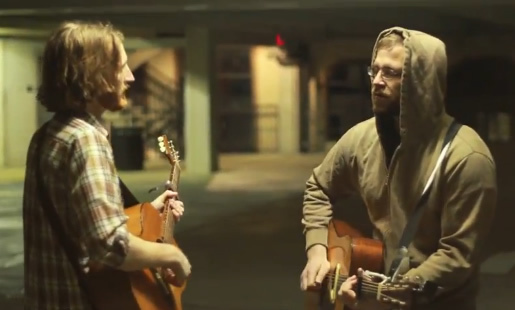 school of music and record production, the Brothers Brian and Brandon Dempsey make up the core of Rollo Greb, with recent addition of Harlan Smith & Cody Blaine, who has consistently impressed live audiences with his solo performances around Chattanooga. Melodic in the manner of Wilco, with an underlying urge to rock very hard. This show could fortell the coming of what could be a new Tennessee rock phenomenon. Bombadil Little brother band to Ramseur Records artists The Avett Brothers and the everybodyfields, Bombadil is busy racking up one of the most extensive live tours in the country with over 50 shows between now and September. Their 5 man multi-instrumental show including strings, brass and percussion can range from rowdy and bombastic to profoundly warm and inviting. Be sure to see all the press on their website about their live appearances at the best small venues all over the country as they tour in support of the new CD "A buzz, a buzz." It takes a lot of talent to get a singer/songwriter booked for one of the ArtFRONT shows at Barking Legs. The clincher was hearing Chris Volpe's 15 song CD, "Refugee Blues." The CD was recorded live in one take, the studio time being the prize for "best song" from the West Coast Songwriting Association. 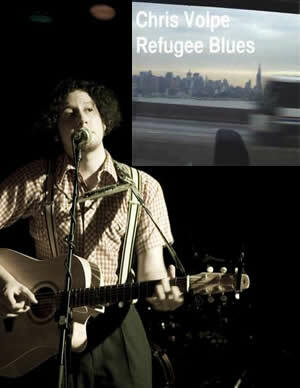 Then subsequently, "Refugee Blues" won "Independent Music Association" Folk Album of the Year! The judges included Norah Jones, Melissa Etheridge, and Bill Wyman. Sounding a bit like Paul Simon with Nick Drake on guitar, Chris also won studio time in London with producer Steve Williams (Sting, Eric Clapton,) in the international competition "We Are Listening." A bonus for our audience will be Charles Theodore Zerner in this duo performance. 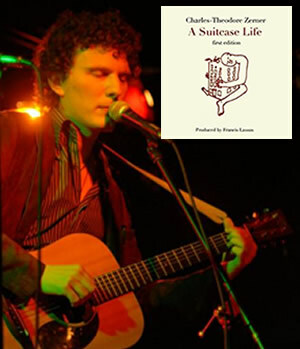 The Harvard educated musician is no slouch himself, having recently recorded an intricately arranged acoustic pop-rock CD in France "A Suitcase Life." Both these artists are performing multiple dates at the increasingly prestigious "Bristol Rhythm and Roots Festival," later this year. Chattanooga based jazz-pop ensemble with Berklee trained guitarist Steve Brehm and Chicago vocalist & songwriter Pete Boubel returns to Barking Legs after gaining attention from their radio rotation on WAWL 91.5. 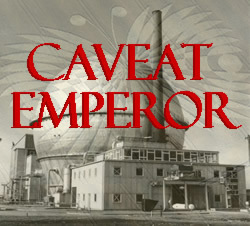 Caveat Emperor is a smoothly running machine which can also hit the emotive power chords and throw a bit of political intrigue to their audience. Listen for live interviews from these artists on WUTC 88.1 and 91.5 WAWL and be sure to call in to request their songs. On Friday Nov. 30th. 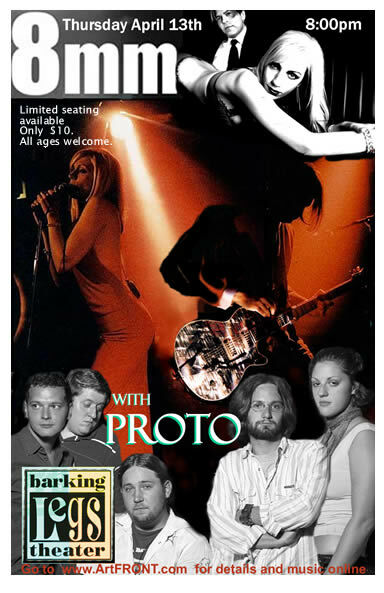 ArtFRONT Presents three of Chattanooga's most talented rock & pop bands with the express purpose of showcasing these deserving artists in Barking Legs' excellent sound setup. Dripping with Serious musicianship, passionate performances and hi tech savvy, these are perhaps the most promising and sonically appealing rock groups to spring from the local music scene. 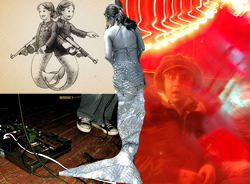 Mermaid Police has just completed their second CD of analog synth heavy songs on the heels of last year's debut recording, which was easily one the best local records in history. The new material is the equivalent of a sonic mood elevator with enough heavy rock chords to offset the blissfully sweet elements in a perfect balance. This rock group sometimes combinbes upright bass & banjo with electronic keyboards and guitars to go from Tex-Mex traditional flavored tunes all the way to goth-punk angst within one song. Add in syncopated video art and truly solid tunesmithing and You get one of the most dynamic cross genera bands ever to come out of the Chattanoga region. Be sure to get a copy of their excellent new 5 song E.P. at the show. makes their Barking Legs debut with some of the most sophisticated song structure available from any local act. Berklee trained guitarist Steve Brehm and Chicago transplant singer-songwriter Pete Boubel invoke nostalgia from the mainsteam jazz era of the sixties and tighten it up with melodic power pop hooks that leave their tunes lingering in your head. Listen for live performances from all these bands on WUTC 88.1 and 91.5 WAWL and call in and call in to request their songs. Unfortunately North American Royalty had to re-schedule their opening performance due to an illness in the family. We hope to have them back again soon. Return to Barking Legs with new songs and new lineup. One of our favorite genuine Americana ensembles, combining pure traditional style with all original tunes. Russell & Cameron Cook take center stage to melt the audience away with their sweet harmonies and intelligent song lyrics. Telling stories of love, lust and the wonderment of the repercussions thereof. 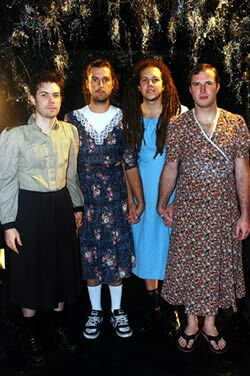 This is a group that is truly meant for the intimate crowd setting of Barking Legs Theater. 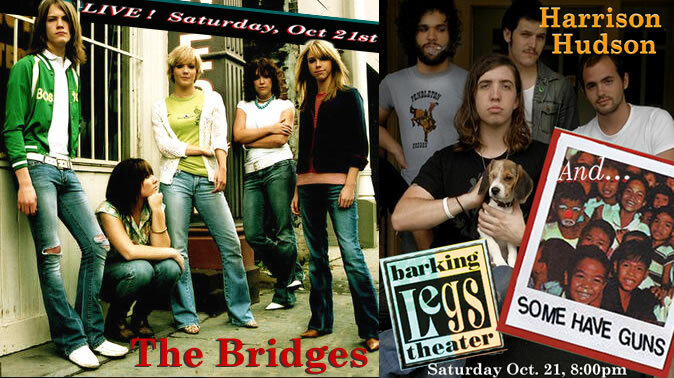 "The Bridges," with Harrison Hudson, & "Some Have Guns"
Three full blown power-pop rock acts in one night. Click here to read a new full length article & Interview with "The Bridges." Also 91.5 FM WAWL has been featuring cuts from "Some Have Guns" new CD and we'll try to have some CD's offered as premiums from WUTC 88.1 during their current pledge drive. Two full bands featuring traditional country & southern rock with beautiful vocal melodies and heartfelt strorytelling will combine for an evening of pure entertainment at Barking Legs. 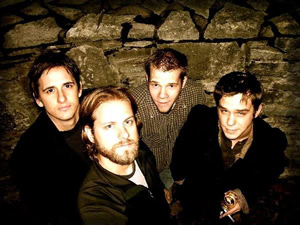 No River City was a part of the largest attended ArtFRONT Show to date and have made instant fans in Chattanooga at their earlier performance here with "Little Country Giants." 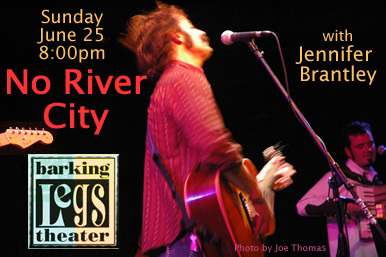 Loosely compared to "The Jayhawks" in style, No River City views all comparisons as an affront and challenges all to come out and experience a real melodic southern rock band with all original material that will leave an impression and their tunes in your head. And Jennifer Brantley celebrates her rising popularity and her new CD which is currently receiving the finishing touches from the producer & engineer of grammy winning recordings by Allison Krause, Ralph Stanley and many others. Hit and Run Bluegrass with Lou Wamp & The Wizards of String. When David Richey, dobro virtuoso formerly of Johnson City TN trio "the everybodyfields" left that band it was a blow to my sense that this was the closest that east Tennessee has come to producing to a "supergroup" in recent memory. The other day while listening to some of David's ultra soulful guitar work on those first two everybodyfields CD's I became aware that Colorado based "Hit & Run" had brought David into their well respected ranks and that they are on a rare tour of the eastern USA. I decided at that moment to throw my support behind any project that Mr. Richey is involved with. But just because a band or artist is well known or highly regarded in the Rocky Mountain States doesn't mean people in Chattanooga have heard of them yet. So In order to bring together the bluegrass and traditional music afficianados in this region I called up Lou Wamp, who not surprisingly had heard all about Hit and Run's many awards. Lou began to spout off all kinds of detailed information about Hit & Run's many successful shows, competitive awards and band members That I wasn't even aware of. 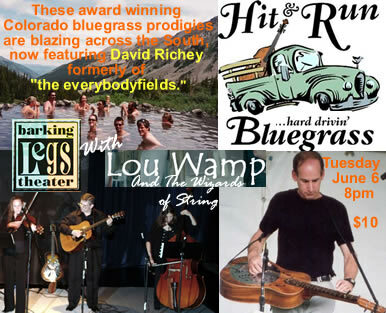 In Short Lou said He would love to support Hit and Run by bringing his own locally well known group of traditional string players together to open up a show for Hit and Run at Chattanooga's Barking Legs Theatre on Tuesday night, June 6th. This is the only date we could get Hit and run to play here on their jam packed tour schedule which includes The Knitting factory in NYC, Smilefest in North Carolina and many other excellent venues that know and cares deeply about bringing in the highest quality musicians for their audiences of real music lovers. So, Lou Wamp and The Wizards of String will be opening for Hit and Run, which features Rebecca Hoggan on vocals, and a five piece group of fast paced top notch young players whom You can listen to online through their website here. And If You've not yet heard Chattanooga's own Lou Wamp & The Wizards of String You owe it to yourself to experience these modern flavored, highly skilled traditional intrumentalists who's performances remind me of the best offerings You hear on N.P.R. 's "Mountain Stage" or GPTV's televised concert series. Check them out at www.LouWamp.com . "Last week I did a quieter show than usual,. Bluegrass resonator guitar player Lou Wamp was my guest host, and I thoroughly enjoyed our discussion, which included comparisons of architecture (Lou's "real" job) and music. Bluegrass is a much bigger category than I first imagined (as is EVERY category, it seems), and I was able to learn a lot. Lou Wamp has quite a history: Did you know Jennifer Daniels studied guitar with him when she was 15? Or that he played electric violin in a prog-country band? He brought some new tracks he'd played on: the new (and unreleased) album from Justin Moses, and some live material from his band The Wizards of String. He also told the story behind "Audrey's Last Dive" which you can read about." Sean and Juliette Beavan are the "Down-tempo Trip Hop" duo "8mm." 8mm co-founder Sean Beavan is a producer and mixer who has worked with a cadre of seminal artists including N.I.N., MARILYN MANSON and DEPECHE MODE among many others. 8mm instantly exploded on Myspace.com after quietly releasing their now critically acclaimed debut EP, "Opener" (please see the below attached press release.) When asked to describe 8mm's sound, I find it hypnotic and melodious with a darkly feminine delivery, fused with a high tech harder rock edge. The best kept secrets in the southern music scene are breaking out of their shells. Saturday Feb.4th, 8:00pm. $10 for all three performances. 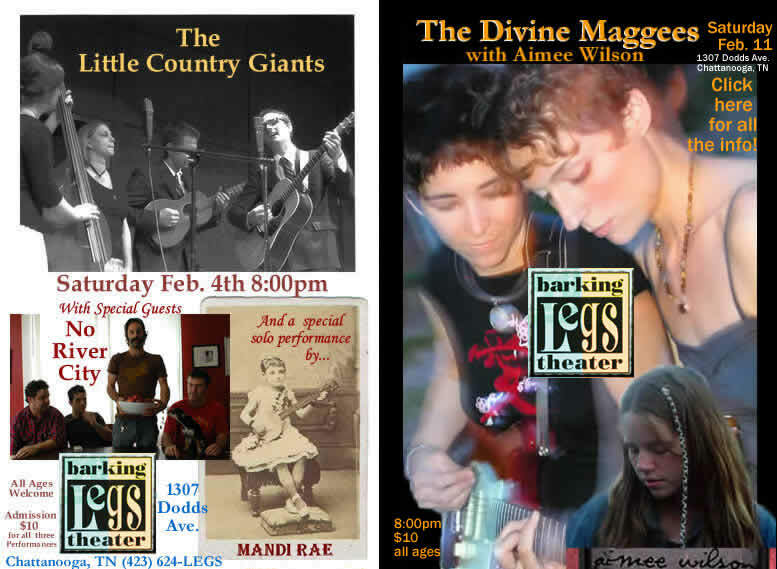 The Little Country Giants, Return to Barking Legs Theatre. A genuine southern acoustic & vocal harmony band who have received Atlanta's Creative Loafing Readers picks award for Best Local Traditional Folk Act (even though they're from Rome Ga, not Atlanta.) Their CD and live recordings have been getting a lot of attention from the DJ's at WUTC 88.1 FM where they have given 2 live studio performances. Their 5 piece all acoustic setup including upright bass, mandolin and impeccable hymnal style vocal harmonies have been receiving glowing reviews in every town they play that has any kind of music press. They are one of the most genuine examples of the Americana style music that is gaining immense popularity across the country. The Little Country Giants fall show has been one of the most talked about performances of the ArtFRONT series so far . So it makes good sense that we bring back this universally crowd pleasing group for another performance. You can listen to some of their tunes online HERE and also at www.myspace.com/thelittlecountrygiants And this time they are bringing with them...No River City, an Atlanta based group The Little Country Giants have been so impressed with No River City that they requested them to open for them at This show in order to introduce them to our Chattanooga audiences. More information on No River City will be up here shortly so please check back.. In the meantime You can listen to some songs on their www.myspace.com/norivercity page and check out some biography at www.norivercity.com Mandi Rae from Birmingham is one of the young performers who is posed to take back country music from the over commercialized grip of the Nashville establishment and give us a genuine taste of the sincere, straightforward narrative and powerful voices of the real south. Full of humor and straight to the point, Mandi Rae has a natural affinity for entertaining and has been a refreshing break in my own music listening of late. Go to www.mandiraemusic.com and to www.myspace.com/mandirae and get an earful of Mandi Rae's punchy tunes and home-made philosophy. Divine Maggees are the most recent focus in the sights of the ArtFRONT talent searchlight. 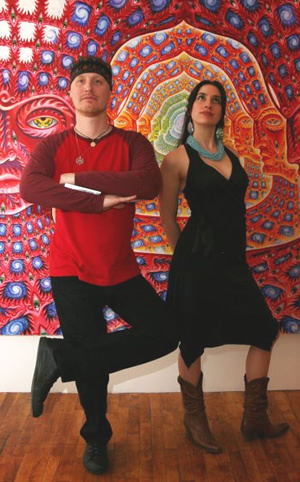 Danielle Tibedo and Cregan Montague are a duo currently based out of Asheville, NC playing electric & acoustic violin & guitar. Their very distinctive vocal harmonies are making listeners I have played them for turn their heads and want to know immediately “who is that?” Comparable to indigo girls & Aimee Mann in style, their voices and lush instrumentals set this team off with an identity of their own that once heard becomes the highly recognizable “Divine Maggees sound.” Both Danielle and Cregan are accomplished alumni of musical and performance arts from early ages, training in institutes such as Berklee College of Music, Wellesley College and the artist development program at Westlake Audio in Los Angeles. The mature, melodic & soulful songwriting on their current full length CD “Love Me Like The Roses” excels on all levels. It is the kind of fresh, substantial and affecting music we are waiting to hear and their appealing personas & biographies will help to inspire a lot of devoted fans really fast. See for yourself at www.divinemaggees.com Please listen to a few of their chill bump inducing vocal harmonies and lush instrumental songs HERE and at www.myspace.com/divinemaggees before coming out to see them play on Feb. 11th along with Aimee Wilson Unique style and humbly presented beauty with an understated passion. I have been watching Aimee Wilson of Chattanooga develop her particular style of ethereal folk music for quite some time. 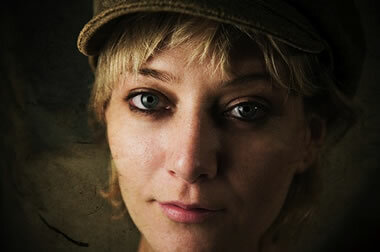 Aimee is more than just an acoustic musician. She is also a visionary leader of her own “movement” of sorts. Ignoring her more common contemporaries rush to play the bar-room venues. Aimee has put together a group of like minded artistic individuals that have gone into unique situations with her music. Such as house and basement concerts, a mission to bring free food, music & art to Chattanooga’s homeless at Miller Plaza, and concerts in acoustically enhancing rooms such as Chattanooga Bouldering Authority’s indoor climbing wall. And recently in a Nashville recording studio, she put together “Timbers Fall,” her first full length 10 song CD. From this young artist’s first offering I am struck that there is genius at work here. Aimee composes songs that open up and reveal a beautiful and complex framework and messages that are very deeply thought out. There are tunes here that will definitely stick with You once you hear them. 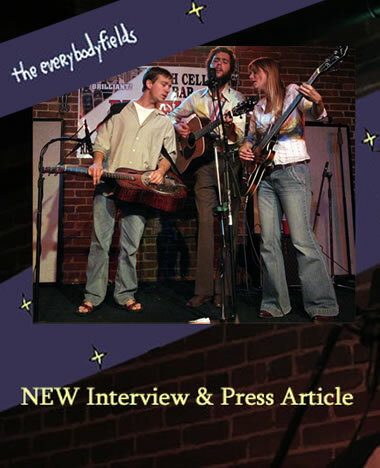 Interview with "the everybodyfields" and the New York City Press release/article. "It takes a while to understand what you're hearing when you see the everybodyfields live because your eyes and your ears are telling two different stories. They are just too young to be making music this timeless. Jill Andrews and Sam Quinn swap bass, guitar, and vocals with easy harmony. You want to say that he's the leader, then her, but they are two inseparable elements in this group. The songs are formed by a pair of remarkable voices, hers notable for its casual maturity, his for a reediness that seems to follow hills and curves in a road that he is traveling in his mind. The vocals are complimented by the sweet and sure sound of David Richey's dobro playing." www.theeverybodyfields.comAppearing with special guest BOB CARTY. Who says Country music can't be experimental, spooky & strange? "Mighty Bob" proves otherwise. "Blessed with a narrative tone similar to that of Tom Waits, 'M Train' cold like William S. Burroughs, with a roots mystique of Woody Guthrie, and the modern spin of Leonard Cohen. Elaborately thought out, and seemingly spontaneous. Shake the dust off those tunes cowboy!" Click HERE to go to Bob Carty's Myspace.com page where You can listen to four complete songs. Saturday, Oct. 15 8:00pm. Barking Legs Theatre, Admission $10 Samantha Murphy returns to Barking Legs for her final performance in the southeast before returning to Los Angeles . She will be supporting Jennifer Brantleyand her Band "The Blue Road Ramblers." Jennifer is currently working on her second full CD with Grammy winning producer/engineer Bil VornDick, who has worked with Allison Krause, Bela Fleck, Ralph Stanley & Bob Dylan among many others. Rounding out this extravagant evening of Americana and vocal harmonies will be The Little Country Giants from Rome Georgia who recently won the Atlanta Creative Loafing Readers pick award for Best traditional folk act. and listen to full length songs by Jennifer Brantley, Little Country Giants & Samantha Murphy! Saturday Oct.15, 8:00pm. $10 for all three performances. If You've grown weary of the commercial country offerings seeping out of the radio these days but long for the true southern American songwriting style of beautiful vocal harmonies and upbeat, melodious musical genius that is native to our region then it can heard in Chattanooga on Saturday, October 15 starting at 8:00pm at The Barking Legs Theatre on Dodds Ave.
Jennifer Brantley has been picked to be the current project of the producer/engineer of Grammy winning records, Bil VornDick, who has made records with Allison Krause, Bela Fleck, Mark O'Connor and Ralph Stanley with Bob Dylan. 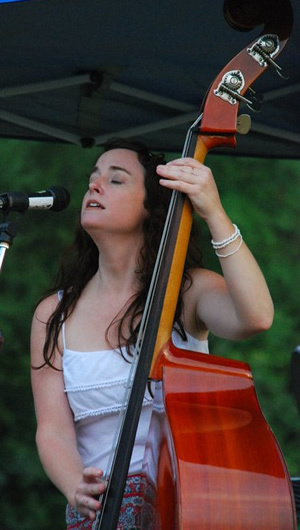 Jennifer Brantleys vocals are reminiscent of stellar vocalists such as Emmylou Harris, Patsy Cline & Tift Merritt. Her upbeat and rocking 5 piece band, The Blue Road Ramblers have been proclaimed every bit as good as major acts who are packing out larger concert halls across the country. According to David Hand, Jennifer's husband & lead guitarist for her band, Bil VornDick has worked on eight Grammy winners and 42 Grammy nominated records. He developed and produced Allison Krauss. His project with Jennifer will be the first speculative album he's done in over 10 years. Jennifer Brantleys songs have climbed to number one slots online at Garageband.com & Mp3.com and have thousands of listeners through sales of her first CD at live shows and have won an honorable mention award from Billboards World Song Contest. 40The Little Country Giants, a true southern style acoustic & vocal harmony band have just received Atlanta's Creative Loafing Readers picks award for Best Local Traditional Folk Act (even though they're from Rome Ga, not Atlanta.) Their CD has been getting attention from the Dj's at WUTC 88.1 FM and their 5 piece all acoustic setup including upright bass, mandolin and impeccable hymnal style vocal harmonies have been getting them glowing reviews in every town they play that has any kind of music press. They are one of the most genuine examples of the Americana style music that is gaining immense popularity that can be found anywhere in the country. And Samantha Murphy with her powerful pop/soul vocals and intense songwriting skills will be returning to the west coast after her tour of the southeast, but not before performing another spectacular set at Chattanooga's Barking Legs Theatre along with all these regional breakout artists. Although Samantha spends most of her time playing and singing for audiences in California, and her style is more cosmopolitan than country, her roots go back to Nashville where she developed her skills at a young age opening up for acts such as Dolly Parton & Willie Nelson with her family's band "The Murphys." At her recent performance in Chattanooga Samantha told a story of meeting Johnny Cash in a hallway of a performance hall, and then went in to one of the hottest renditions of "Ring of Fire "imaginable. If You missed Samantha's earlier shows here, or in Nashville or Atlanta, this is your final chance to see her up close before she returns to the west coast to play for audiences in Los Angeles, San Diego, Denver and elsewhere. 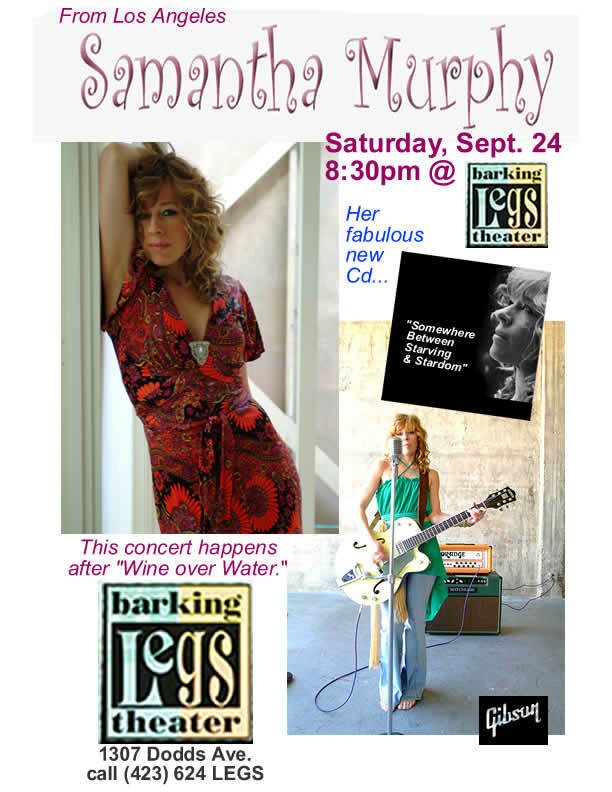 Sept 24 SAMANTHA MURPHY, From Los Angeles will Perform at The Barking Legs Theatre at 8:30pm. Samantha has an excellent new CD titled "Somewhere Between Starving & Stardom" Listen to some of her songs and check out the incredible wealth of information on Samantha's professional career at www.samanthamurphy.com & on www.myspace.com/samanthamurphySamantha is one of my top finds since I’ve been scouring the music scene for relatively unknown artists with high levels of talent. But calling her unknown is not fair because Samantha Murphy is a real professional. 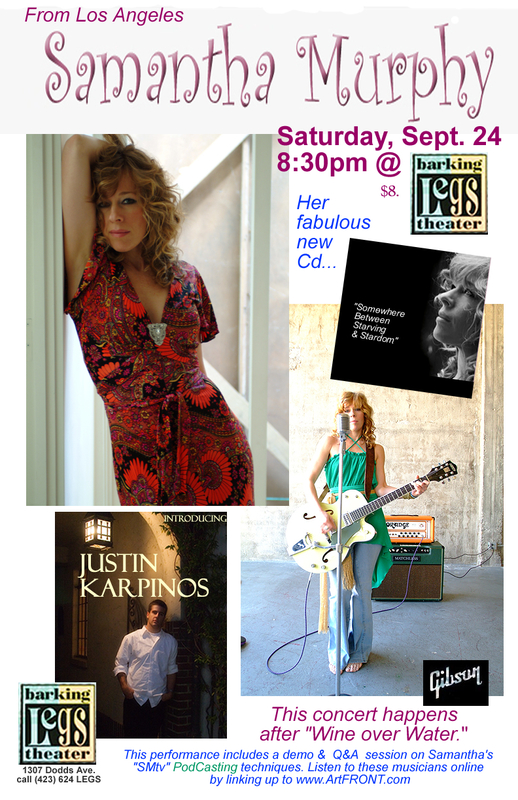 Between her regular gigs at L.A. music showcase “The Mint.” Her regular podcast on SamanthaMurphy.com and her songwriting she has found time to appear on The Tonight Show, Be Sponsored by Gibson Guitars and put together one of the finest pop/female vocal CD’s of the past few years. Samantha has a spectacular voice and every time I re-listen to her new CD I keep being amazed at just how enjoyable it is, and that’s even with a 98% radio friendly song list. The Songs on Somewhere between Starving & Stardom chronicle the joys & challenges that anyone who has ever tried to live a creative lifestyle in this country can strongly relate to. But her approach is always upbeat in a way that shows off Samantha’s sparkling talent rather than lamenting over the hardships facing creative artists in our over commercialized music environment. Samantha is gracious enough to come and play for us here in Chattanooga on Saturday Sept. 24 in a solo performance along with Justin Karpinos at Barking Legs, and again on Oct. 15, along with Jennifer Brantley & The Little Country Giants at The Barking legs theatre. In addition to the musical performance by both artists this show will also feature a demo/Q&A session of Samantha's highly impressive "podcasting" techniques In which she demonstrates the use of podcasts for the listeners and then has a Q& A session on setting up your own podcast for music, talk shows reports or anything You can imagine. This session should appeal greatly to the technically aware musicians and music lovers who are looking for the best new ways to get their music out to the public, now and well into the future. SMtv is a Podcast dedicated to true, independent artists. Hosted by Samantha Murphy, a singer songwriter herself, SMtv sits down with a different artist each week to discuss their life and art. Each episode comes to you from a different location as Samantha travels from place to place. Past episodes have featured Mark Hart of Crowded House and Inara George. Run a Google search for "Singer Songwriter." Samantha Murphy is the first name that comes up. Sept 10, JEN WOODHOUSE, from Birmingham www.jenwoodhouse.com Jen is making a name for herself among fans of melodic female vocalists & songwriters. Her professional career is blossoming with her high end production CD and her extensive tour schedule, which is taking her from Los Angeles to Toronto in the month of September alone. Listen to Jen at www.myspace.com/jenwoodhouse . And for local fans of Jennifer Daniels, Jen could be Jennifer's soul mate, I'd like to introduce them! Jen Woodhouse has also decided to donate 100% of the profits from her CD Baby.com sales to the Red Cross to aid the New Orleans Hurricane victims. We all do what we can & we all deserve to hear some great music, so get on out and support and enjoy these performers this weekend in Chattanooga. 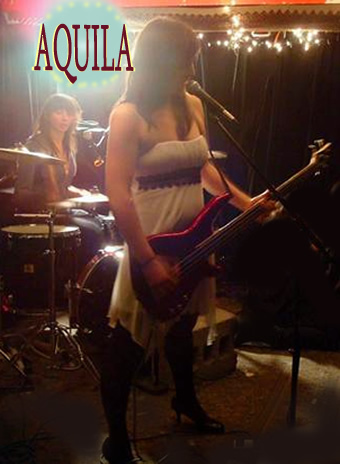 "EXIT LETTER" rock/pop/female vocalist. These Chattanooga based performing Artists have A CD that rivals major label bands in quality. Produced by Matt Goldman's Atlanta "Glow in the Dark Studios," the production facility that is turning local bands into recording artists with grammy quality sound. Exit Letter is embarking on a new phase with drummer & recording engineer Beau Bridges added to their lineup. Be on the front line to see them launch into a new era in their full setup. 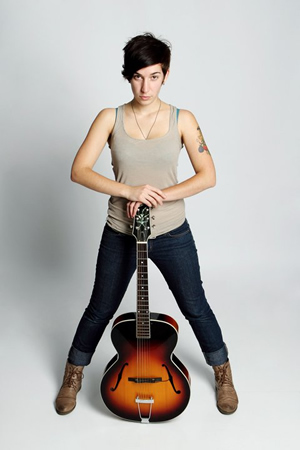 Heather Linke, their lead singer/guitarist, will be performing a short solo set as an opener for Jen Woodhouse. Then after Jen's full set Heather will return to the stage with EXIT LETTER. Be sure to listen to their 4 full length Songs at www.myspace.com/exitletter and then visit their own website www.exitletter.com THORNTON from Nashville. If Rufus Wainwright and Jeff Buckley were three people and sang harmonies as well as playing piano, guitar and drums You would have approximately the dark melodious framework of Thornton. Which consists of Kevin Thornton on Guitar, Piano & Vocals, Enoch Porch on Drums and vocals & Luke Jones on bass & vocals, with all members switching out instruments during their sets. The Nashville Scene writes, "Thornton is already garnering attention in their home market, drawing capacity crowds and praise from local media.... Thornton was the evening's by far, best band... especially distinctive due to the band's sonic and dynamic range, which is greater than what most rock trios are capable of. Add to this Thornton's smirking, dark appeal, and you have an artistic vision that's not only creatively relevant but also, one hopes, commercially viable." Thornton was recently awarded a Nashville Scene Music Award for Best Rock/ Experimental. Thornton independently released "Had A Sword" on Sept 4th 2004. The CD is available online & at live performances. Listen to 4 complete songs at www.myspace.com/thornton then check out lots of other info on this most intriguing new band. www.EnochLives.comFeaturing local guitar legends SKIP CISTO 's bluesmanship and the multi-talented JIM PALMOUR, who has graced the stage of Chattanooga's Theatre Center as the band leader in the "Always Patsy Cline" musical, as just one among many of his accomplishments on the Chattanooga music scene. Both these gentlemen are revered as serious musicians and since this is an ArtFRONT sponsored event You know we'll be tweaking the knobs and getting the sound right for this indoor/outdoor event overlooking Coolidge Park & The Tennessee River. Cody Blaine, has been making appearances at nearly all of Chattanooga's venues and even a few radio stations lately and for good reason. His "neo-post-80's" song writing style captures everyone's attention and surprises critics and music veterans alike. Compared to "Television's" Tom Verlaine with a little bit of Elvis Costello, Cody has been proving himself as a true performing artist with his thought provoking and melodious songs. Listen to a few of them at myspace.com/codyblaine but be advised that he seems to be coming a long way forward with every performance. Catch him now while he's on his climb up the ladder. 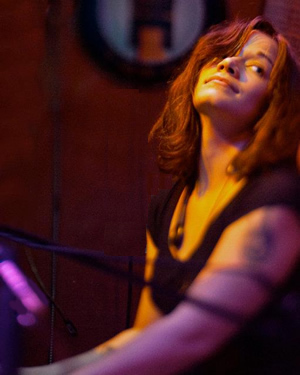 Leticia Wolf, local rocker & stylist turned melodious storyteller has been drawing a crowd locally ever since her days with "Sweet Bangin A" and now as the host and top billed artist in her "River City Women who Rock" series at Rhythm & Brews. You can read more about Tish here www.ArtFRONT.com/ConcertReviews.htm Just scroll down the concert reviews until You find her. Heather Linke Pop Rock songstress can be heard with her band "Exit Letter" at www.myspace.com/exitletter I wish I had more information on Heather here but her songs on this link are what inspired me to invite her to play this show, along with a recommendation from drummer & recording engineer Beau Bridges. We value Your opinion on music! Any suggestions on artists You would like to see come & play in this Chattanooga venue will be taken seriously. Please E-Mail any ideas & info. on artists who You would like us to consider contacting for a show to .